Hereditary non-polyposis colorectal cancer (HNPCC) is an autosomal dominant disease with a high risk for colorectal and endometrial cancer caused by germline mutations in DNA mismatch-repair genes (MMR). HNPCC accounts for approximately 2 to 5% of all colorectal cancers. Here we present 6 novel mutations in the DNA mismatch-repair genes MLH1, MSH2 and MSH6. Patients with clinical diagnosis of HNPCC were counselled. Tumor specimen were analysed for microsatellite instability and immunohistochemistry for MLH1, MSH2 and MSH6 protein was performed. If one of these proteins was not detectable in the tumor mutation analysis of the corresponding gene was carried out. We identified 6 frameshift mutations (2 in MLH1, 3 in MSH2, 1 in MSH6) resulting in a premature stop: two mutations in MLH1 (c.2198_2199insAACA [p.N733fsX745], c.2076_2077delTG [p.G693fsX702]), three mutations in MSH2 (c.810_811delGT [p.C271fsX282], c.763_766delAGTGinsTT [p.F255fsX282], c.873_876delGACT [p.L292fsX298]) and one mutation in MSH6 (c.1421_1422dupTG [p.C475fsX480]). All six tumors tested for microsatellite instability showed high levels of microsatellite instability (MSI-H). HNPCC in families with MSH6 germline mutations may show an age of onset that is comparable to this of patients with MLH1 and MSH2 mutations. Hereditary nonpolyposis colorectal cancer (HNPCC) is characterized by very high risk for colorectal cancer . In addition, endometrial and ovary cancer risk as well as risk for tumors of the ureter, renal pelvic and small intestine is increased. Germline mutations of MLH1 and MSH2 account for 70% of all HNPCC cases . Approximately 5–10% of HNPCC families carry a germline mutation in the MSH6 gene [3–5]. Here we report six germline mutations in the mismatch-repair genes MLH1, MSH2 and MSH6, that to our best knowledge have not been described (Medline and HNPCC mutation database http://www.nfdht.nl. This study was approved by the ethical committee of the Medical Faculty of the Ruhr-University Bochum. All patients underwent interdisciplinary counselling by a geneticist, clinician and psychologist. Patients included in this study fulfilled the Amsterdam or Bethesda criteria . Substantial pedigree information moreover including the revised Bethesda criteria  is given in table 1. After given informed consent blood samples were drawn for genetic testing. Genomic DNA was extracted using standard protocol . Formalin fixed and paraffin embedded tumor tissues were obtained from different primary pathologists and sent upon request to the local reference pathology of the Familial Colorectal Cancer Center of the Ruhr University Bochum. Tumors were reexamined for histomorphological HNPCC features, immunohistochemical MMR repair protein expression and microsatellite instability. Tumor and surrounding normal tissue were microdissected by a skilled pathologist. Tumor cell cellularity was at least 70%. DNA was isolated with the QIAamp DNA Mini Kit (Qiagen, Hilden, Germany). Microsatellite markers BAT-25, BAT-26, D5S346, D17S250, D2S123 and BAT-40 were amplified. The markers included the NIH reference panel according to the international guidelines for the evaluation of MSI in colorectal cancer (Boland et al., 1998). Primer sequences are available on request. Tumors were classified as having high grade microsatellite instability (MSI-H) if at least 30% of the markers showed instabilities. Microsatellite-PCR reactions were performed in 96-well microtiter plates, in 20 mmol/L Tris-HCl, pH 8.4, 5 mmol/L KCl, 1.5 mmol/L MgCl2, 100 ng of each primer, 200 mmol/L dNTPs, 60 mmol/L TMAC (Sigma, Taufkirchen, Germany), 1.5% formamide, 2 ml DNA template (tumor or normal tissue), and 1.5 units Taq DNA polymerase (Gibco BRL, Karlsruhe, Germany), in a final volume of 15 ml. Reactions were performed in a Hybaid Touchdown temperature cycler (MWG-Biotech, Ebersberg, Germany), for 40 cycles of 94°C for 15 seconds, different annealing temperatures for each marker for 30 seconds, and 72°C for 30 seconds, and a final extension at 72°C for 5 minutes. BAT-25, BAT-26, BAT-40 and D2S123 were amplified with an annealing temperature of 60°C, whereas D5S346 was performed at 58°C and D17S250 at 53°C. PCR products were separated on 6% polyacrylamide, 8 mol/L urea gels and DNA fragments were visualized by silver staining. For immunohistochemistry 3 μm thick sections of formalin fixed paraffin embedded tumor tissue were mounted on poly-L-lysine capillary slides and dried overnight at 37°C. Paraffine sections were dewaxed with xylene, rehydrated in a graded series of alcohol and finally washed in Tris-HCl (pH 7.6) for 10 min. The following steps were performed at room temperature in an automated staining system (TechMate 500, Dako, Glostup, Denmark). To avoid unspecific staining, sections were blocked with buffer 1 (Dako) for 5 min prior to incubation with the primary antibody at the appropriate dilution in blocking buffer (Zytomed, USA) for 30 min at room temperature. As primary antibodies mouse monoclonal antibodies for MLH1 (BD Biosciences, 1:20), MSH2 (BD Biosciences, 1:20) and MSH6 (BD Biosciences, 1:50) were applied. After several rinses in buffer (Buffer Kit, Dako) the immunoreaction was demonstrated using the APAAP Kit (Dako) according to the specifications of the manufacturer. Fast Red (Dako) was used as alkaline-phosphatase substrate. Finally sections were rinsed in distilled water and counterstained with Mayer's haematoxylin (Dako). 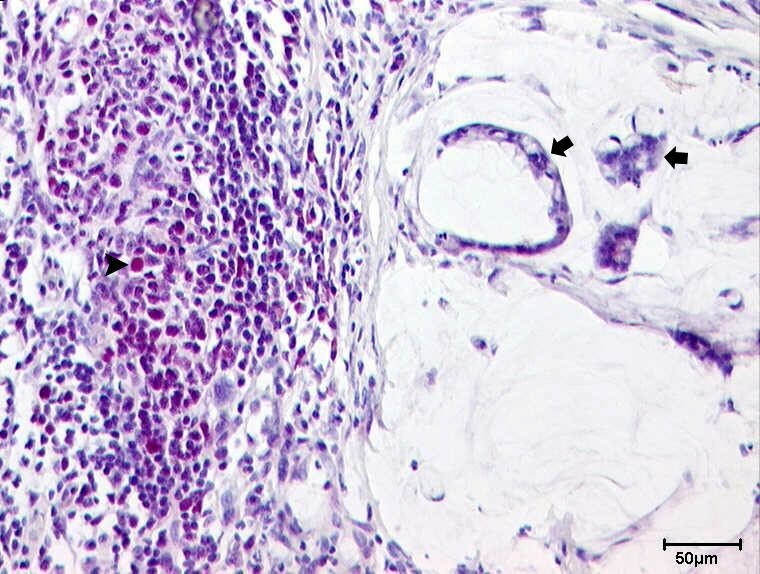 Staining was considered only informative when there was normal nuclear staining in adjacent non-neoplastic cells, which served as internal control. Less than <1% of stained tumor cells was considered as loss of expression of a MMR protein, whereas 10–100% of stained tumor cells was considered as normal staining. Exons and flanking intronic regions were sequenced by using ABI standard protocols. Primers are available on request. For all systems forward and reverse strands were sequenced. Sequencing was performed corresponding to the immunohistochemical result. If MSH2 staining was reduced or negative and MSH6 staining negative as well, the MSH2 gene was sequenced at first. Pathogenic relevant mutations were sequenced twice and confirmed in a second blood sample of the patient. Mutations were named according to the nomenclature of den Dunnen and Antonarakis . All tumor specimens of the investigated patients showed MSI in at least 2 of five tested loci and therefore were classified as MSI-H. Tumor tissue of all patients was immunohistochemically stained (table 2). Microsatellite status and immunohistochemical staining of tumor tissue, result of sequencing analysis in all investigated patients. MSH2 pos, MSH6 neg, MLH1 pos. Person 0546-2 showed no MLH1 expression in the tumor compared to normal tissue. The pedigree fulfilled the Amsterdam II criteria. Sequencing analysis revealed the germline mutation c.2198_2199insAACA in exon 19 of MLH1. This frameshift mutation results in a premature stop at codon 746. Sequencing of the whole coding sequence including exon-intron boundaries showed no other abnormalities. Moreover similar mutations near to nucleotide position 2198 of MLH1 have been described earlier as pathogenic. Patient 0699-3 presented with two metachronous colon cancers at the age of 40 and 53 years (criterion 2 of the old  and revised  Bethesda guidelines). 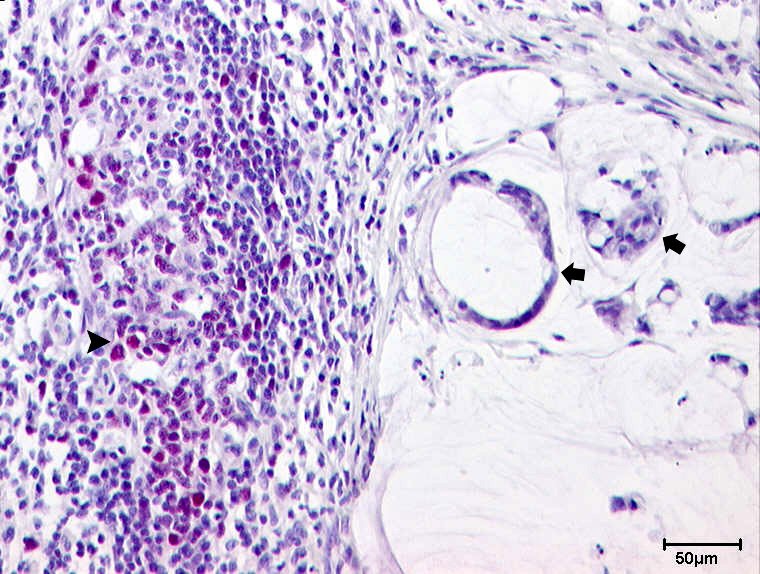 The tumor tissue of patient 0699-3 showed the MSI-H phenotype. The MLH1 protein was not detectable by immunohistochemistry and a germline mutation c.2076_2077delTG in codon 693 of the MLH1 gene was detected. The resulting protein is predicted to consist of 702 amino acids. Patient 0545-0 developed left sided colon cancer at the age of 29. The family history fulfilled criterion 2, 3 and 4 of the Bethesda guidelines respectively criterion 1, 2 and 4 of the revised Bethesda criteria. Tumor tissue showed no MSH2 expression and stained negative for MSH6. The latter finding is likely caused by the reported heterodimer formation between MSH2 and MSH6 . Microsatellite analysis of the tumor tissue from this patient revealed a MSI-H status. Sequencing revealed the mutation c.810_811delGT in the MSH2 gene. This deletion of two nucleotides leads to a truncation of the MSH2 protein after 281 amino acids. In patient 0729-5 and 0660-6 we identified the mutation c.763_766delAGTGinsTT [p.F255fsX282] and c.873_876delGACT [p.L292fsX298] respectively in the MSH2 gene. Tumor tissue of patient 0729-5 staining positive in 1–10% tumor cells using the MSH2 antibody. The tumor of 0660-6 was immunohistochemically deficient for the MSH2 protein. Microsatellite analysis of tumor tissue of both patients showed MSI-H. The pedigrees of both patients match the Amsterdam I criteria. The immunohistochemical staining of patient 0660-6 is shown in Fig. 1. MLH1 staining Patient 0660-6: Mucinous adenocarcinoma of the colon with a strong nuclear staining (red staining product) of the tumor cells (arrows) for MLH1 (1). Patient 0531-X had tubulovillous adenoma at the age of 39. Colonoscopy was performed annually and the patient developed seven adenomas within a two years follow-up period. 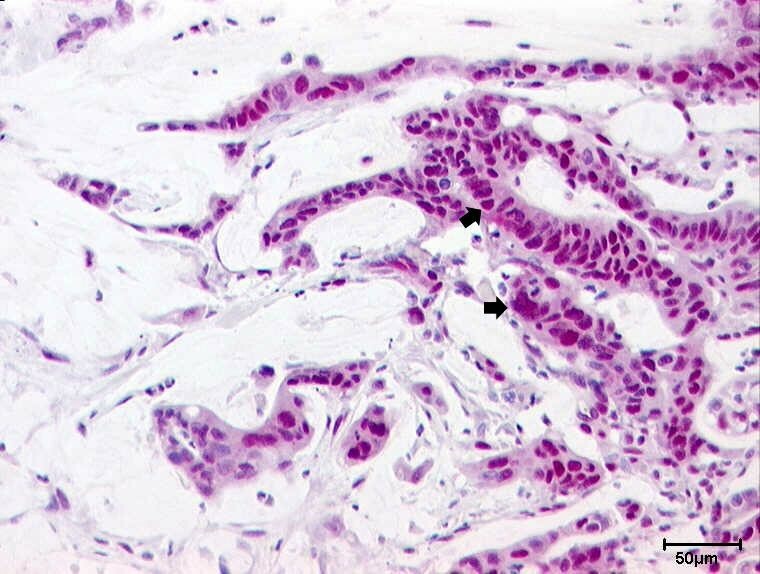 The sister presented with an adenoma of unknown histology at the age of 41. The 40 year old grandmother died of colorectal cancer. So far no female developed endometrial cancer. This pedigree fulfilled criterion 7 of the Bethesda guidelines . Criterion 1 of the revised Bethesda guidelines is met. Tumor tissue of patient 0531-X revealed MSI-H. Firstly, immunohistochemistry of MLH1 and MSH2 was performed only and revealed normal expression of MLH1 and MSH2 protein in the tumor tissue. In addition, immunohistochemistry of MSH6 was done and showed loss of MSH6 protein expression. The frameshift mutation c.1421_1422dupTG [p.C475fsX480] in the MSH6 gene was detected. The father of the index patient was not affected by HNPCC-associated cancers and is currently aged 65. Although the published data supports the notion of a later onset of disease in HNPCC families carrying an MSH6 mutation, this was not the case in our family. The index patient and her sister started to develop adenomas by the age of 39 and 41 years respectively. Moreover the paternal grandmother died of colorectal cancer at age 40. These findings are comparable to data for MLH1 and MSH2 mutation positive individuals with HNPCC. Our phenotype data imply that HNPCC associated with MSH6 gene mutations may show an age of onset that is comparable to this of patients with MLH1 and MSH2 mutations. Therefore, screening recommendations should not be loosened for families with MSH6 gene mutations.